Huawei's smartphone division is riding on a wave of success that picked up speed last year with the introduction of the P20 series. However, Huawei is not resting on its laurels, it is reaching for the stars with the new P30 Pro. In our full review of the Huawei P30 Pro, you can find out what technical refinements the Chinese manufacturer tries to impress smartphone users with. The Huawei P30 Pro will have two variants - one with 8 GB of RAM and 128 GB of storage, and one with 8 GB RAM combined with 256 GB of storage. In the UK, the P30 Pro launches on April 5th. It is available from EE, Vodafone, Sky Mobile and Carphone Warehouse. The 128GB variant costs £899 and the 512Gb version will set you back £1,099. In terms of looks and feel, a lot has changed for Huawei's flagships in recent years. The Chinese manufacturer has shown a lot of courage, especially when it comes to colors. And that courage was rewarded with a total of 16 million Huawei P20 and P20 Pro sales in 2018. The Twilight color variant sold best in the UK, Italy and Portugal. For its successor, the Huawei P30 Pro, the Chinese brand is expanding the gradient variety. Instead of one, there are now three dazzling variants. The palette ranges from classic black to Permute White, Breathing Crystal, Amber Sunlight and Aurora. The availability of the colors varies from region to region. In Germany, for example, there will be no Mother-of-pearl white. The new colors look great, especially the orange-red version of the Huawei smartphone. It's a real eye-catcher. Apart from the look, the craftsmanship is impressive. The P30 Pro looks and feels high-quality. And although IP68 certification is becoming the standard, it is still worthy of praise. The notch on the P30 Pro has also become much smaller. The reason for that is that Huawei has decided not to use the facial recognition camera found on the Mate 20 Pro. You will not find a conventional telephone loudspeaker either. Instead, Huawei makes the display oscillate and uses part of it as a loudspeaker. Huawei uses an AMOLED panel of excellent quality in the P30 Pro, and its strengths are fully utilized. Contrasts and colors are great. The sharpness is so good that I don't miss a higher resolution. The huge display is also perfect for movies and games. There hardly are any surprises when it comes to software, as Huawei naturally uses its own user interface EMUI on the P30 Pro. It's available in version 9.1 on the P30 Pro and it's based on Android 9.1. EMUI meshes comparatively strongly with Android. It is very noticeable not only thanks to its appearance but also due to many of its own functions. However, the interface is not always well-received by all users. Many prefer the tidy look of a more stock-like Android and simply don't need many of EMUI's own functions. With Version 9, Huawei has significantly streamlined EMUI, made it faster and increased operating comfort. This makes the system easier to use than before. I also like the adaptability. I've come to terms with most things in EMUI over time. Huawei is increasingly relying on its own apps for almost everything that Google offers in its mandatory apps for Android. The Huawei P30 Pro even has its own browser on board, as well as its own App Store. That would bother me less if you could uninstall or at least deactivate these apps, but that doesn't work. It's an incomprehensible strategy, which makes unnecessary work for the manufacturer and offers me, as a customer, no added value. The basic technical platform for the Huawei P30 Pro is supplied by the Mate 20 Pro. The Kirin 980 SoC, including dual NPU, Mali G76 MP10 GPU, 8GB of RAM and depending on the variant you choose, internal storage of 128/ 256 or 512 GB. If you want to expand the memory, you'll have to use the new Nano SD card, just like with the Mate 20 Pro (these are currently only available from Huawei itself). With this hardware under the hood, the Huawei P30 Pro is on a par with the Mate 20 Pro in terms of performance. Actually, everything. If you look at the performance in everyday life, the smartphone reacts quickly and fluidly and shows no annoying dropouts or seconds of stuttering. It does everything it should. 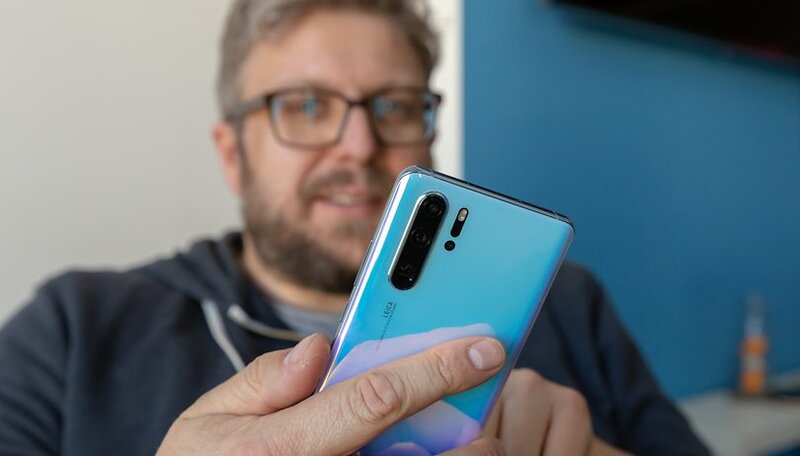 Apps start without delay - I didn't experience any crashes or similar unpleasant things during my Huawei P30 Pro review process. Games were fun too. With this smartphone, you will still be having fun in two or three years. While the performance of using the smartphone is always good, I have to put the blame on Huawei for not using 3D face recognition. The P30 Pro only scans in 2D from the front camera, which is less reliable and a little slower than the Mate 20 Pro. In the dark, you can forget the face scan, and even with sunglasses, the smartphone doesn't recognize me. The alternative is using your fingerprint. Unfortunately, it also doesn't work very reliably and only recognizes my finger with a success rate of about 70 percent. That's why I'm not really satisfied with the mixed results on the biometric side. When it comes to audio, Huawei does not use a 3.5mm jack. In keeping with the spirit of the times, it has instead placed a USB-C headset and an adapter in the box. Both are of average quality, but are better than nothing. The speaker integrated into the display works without any problems when making calls, the voice quality is good. But if you listen to music on your smartphone, you'll have to make do with a mono speaker. It now sits next to the USB port instead of inside it. This is good for the sound. But why didn't any other manufacturer, no matter if it was a smartphone or a full-fledged camera, just use yellow pixels instead of green ones? And why change the familiar Bayer filter when it has proven its worth over the decades? Because the effort involved in development, production and also in everyday life was probably too high for the recalculation of the green component. Huawei, therefore, has to recalculate the green color information missing from the raw sensor data with the help of signal processors and software. What is pleasing, at first glance, is a seemingly trivial change for everyday life. In the camera app, you can immediately decide whether you want to take a photo with the help of artificial intelligence or not. Gone are the days when you had to immerse yourself in the app's settings each time to deactivate the master AI. With three different focal lengths, plus hybrid zoom and 50x digital magnification, the P30 pro's camera is incredibly versatile. What's more, the quality of the zoom shots in particular for this level of magnification, and the fact that we're still talking about a smartphone camera, is simply outstanding. Taking pictures with the P30 Pro is just incredibly fun. This is also due to the second discipline in which Huawei sets standards: low light. Google's night mode is already impressive, but Huawei is adding another one to the P30 Pro, and without any mode of its own. The camera of the P30 Pro conjures images onto the sensor in almost complete darkness, making it a real pleasure. You can forget the night mode that Huawei still has. This camera is a quantum leap in terms of low-light. So that the P30 Pro doesn't run out of juice quickly, Huawei has equipped the smartphone with a 4,200 mAh battery , which is charged by cable with 40 watts and wirelessly with 15 watts. The reverse charge function from the Mate 20 Pro is also on board. In theory, the Huawei P30 Pro should have an excellent battery life - and it actually does. More than 14 hours in PCMark's battery benchmark at medium brightness are enormous, even with the display fully turned up it's just under nine hours. Hardly any smartphone can keep up with this. In my test, the P30 Pro regularly only needed to be recharged after two days - that's a real relief. The battery life of the P30 Pro with a single charge is fantastic, especially if you've used a smartphone that really disappointed you previously. Huawei's fast-charging technology is extremely quick and has saved me more than once a day, or usually an evening. Reverse wireless charging, on the other hand, is a nice gimmick when you want to impress someone with what your smartphone can do. The P30 Pro has set the bar extremely high for smartphone cameras. Its competitors, such as the Google Pixel 3 XL, Apple iPhone XS or the new Galaxy S10 models from Samsung, have to stretch themselves to keep up. Whether it's zoom, AI functions or - above all - low-light, Huawei seems to be a huge step ahead of the competition. It's easy for me to cope with the fact that the video performance can't quite keep up, because we're still talking about a really good level here. But the camera isn't everything. The P30 Pro looks seductively good, has a current and regularly maintained Android version, plenty of memory and great performance. The battery performance is also outstanding compared to other flagship smartphones. Only the software lags a bit behind the hardware. Here, Huawei has room for improvement and a lot of potential. If the Chinese manufacturer can get this under control, the competition should be very worried. The bottom line: I can offer a clear recommendation to buy this smartphone. I just ordered my Breathing Crystal P30 Pro. I gave my iPhone X to my mom. Best phone out now, already preordered. Here is a question: hardly anyone indicates whether these phones are dual sim standby or have dual sim active - why is no-one looking into this when reviewing the phones? For me this is a killer feature as i not only want to distinguish between private and business phone calls, but also between private and business whatsapp..
you do not need both cards to be active to use WhatsApp with two numbers. You simply need to register both numbers with WhatsApp. The app does not care what data connection you are using after registering. Sorry if these seem like stupid questions, but I've heard conflicting stories concerning Huawei. Is it safe to own these phones? Is it a trustworthy company as far as whatever claims are being made about what the Chinese are doing with these phones. I'm asking because I like the phones but am afraid to buy them. What do you think? Is it a hoax? There is zero evidence to back up any of the allegations, Huaweis are safer than any phone using proven American sp y chips that's for sure.